Emily Orta survived sudden cardiac arrest at age 14. Emily Orta can't remember when she nearly lost her life on the soccer field last year, but it came as a shock to her parents, coach, teammates and everyone who knew her. An active athlete for most of her life, Emily appeared perfectly healthy until the day she collapsed during a practice drill at the age of 14. 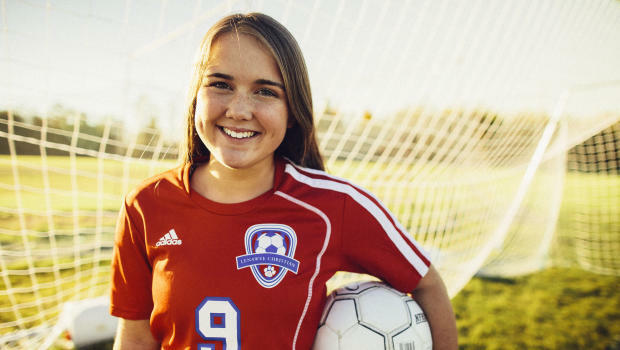 Initially thinking she was experiencing a seizure, Emily's coach alerted her parents and soon realized she had gone into sudden cardiac arrest - meaning her heart had stopped beating. Emily's parents, Autumn and Michael Orta, were both 45 minutes away at the time. Autumn remembers being in complete disbelief. "So many questions start to run through your head about how this could happen to such a healthy, active kid," she told CBS News. "The only thing I could think to do was to pray and ask for prayers. We felt so helpless." At the field, a lifeguard from the school administered CPR and a team of first responders were able to shock Emily's heart to start beating again using an automated external defibrillator (AED). Emily was rushed to a local hospital then flown to the University of Michigan's C.S. Mott Children's Hospital where doctors diagnosed her with ALCAPA, or Anomalous Left Coronary Artery from the Pulmonary Artery. This condition is a congenital heart defect in which the left coronary artery, which carries blood to the heart muscle, is connected to the pulmonary artery instead of the aorta. Emily's doctor, Dr. Jennifer Romano, a pediatric cardiac surgeon at Mott, said the case was extremely rare, as most cases of ALCAPA are picked up in infancy. Emily and her family never knew she had it. "I've been active my entire life," Emily said. "I've done soccer, cheer and track. So the fact that nothing had happened before really surprised me." After three weeks in the hospital, Emily underwent surgery and was able to go home about a week later. She now says she feels better than ever and has been cleared to return to the soccer field. But not everyone is as fortunate. According to the American Academy of Pediatrics, as many as 2,000 young adults under the age of 25 die of sudden cardiac arrest each year, though the actual number is not known. ALCAPA is one cause of sudden cardiac arrest in young people, but it is not the most frequent one. "The most common cause for cardiac arrest in young people is some type of arrhythmia (abnormal heart rhythm) that can be caused by a multitude of things," Romano said. These causes include hypertropic cardiomyopathy -- a congenital heart muscle disease in which the walls of the heart's left ventricle become abnormally thickened, leading to obstruction of blood flow from the heart -- and Long QT Syndrome, a disorder of the heart's electrical activity that can cause sudden, uncontrollable arrhythmia. Other conduction abnormalities that lead to arrhythmia and structural heart defects can also cause sudden cardiac arrest, Romano said. Screening for these heart conditions can help prevent sudden cardiac arrest, experts say. The American Heart Association does not recommend electrocardiograms for every student athlete due to the cost and insufficient evidence that the tests pick up every heart abnormality. Rather, the organization recommends a screening process that involves taking a detailed personal and family history and a physical exam that includes measuring blood pressure and listening to the heart. This evaluation is meant to flag individuals who should be referred to a cardiologist for further tests, which may include an electrocardiogram and ultrasounds to look at the structure of the heart. Romano notes that while instances of sudden cardiac arrest are somewhat more common in student athletes, any young person can be affected. "This can happen anywhere to any child," she said. "If a child is simply running to the bus, anytime they're doing an extreme activity or pushing themselves, they can have an event. Athletes, especially performance athletes, push themselves quite a bit." Romano suggests checking in with children and seeing a doctor if anything seems off. "If your child has any complaints of a racing heart with activity or if a kid is noticeably easier to fatigue than their peers, that can be a sign of concern and you should talk to your pediatrician," she said. "Certainly any kid who's passed out during activity, you're going to want an evaluation by a cardiologist to make sure there's nothing going on." Another way to prevent deaths from sudden cardiac arrest in young people is for schools and other organizations participating in kids' sports to be prepared for such episodes with an automated external defibrillator (AED) readily available and someone trained to use it. "With an AED, you have the ability to shock the heart and knock it back into a regular rhythm," Romano said. "That needs to be done in a relatively short period of time. You only have about three minutes to reestablish blood flow to the brain before irreversible brain damage is done. Being prepared for that and having the resources on the sideline at these games is key." Project Adam, a multi-state initiative which began in Wisconsin after 17-year-old Adam Lemel collapsed and died while playing basketball, is aimed at providing schools with the tools and education needed to implement programs making AEDs available. Emily said she hopes sharing her story will increase awareness of sudden cardiac arrest in young people and inspire officials at schools and organized sports leagues to be prepared. "Every school should have an AED and people who are CPR certified," she said. "Without these things at my school I wouldn't be here today to tell my story."